Reel Steal is one of Net Entertainment’s most popular slot games today, and it doesn’t take long to find hordes of YouTube videos of players around the world enjoying huge wins, thanks to the highly-profitable bonus-round potential. Set back in 1970’s, Reel Steal combines American Cop TV Shows, with a Gangster-like feel, and with a “Starsky and Hutch” feel to it, Reel Steal really is one of the Net Entertainment’s most solid games. Design-wise, it’s nothing too special; not to put-down Net Entertainment… but it’s clear the graphics and background of the game is deliberately meant to look a bit dated and old-school, in order to further the realism of the game. 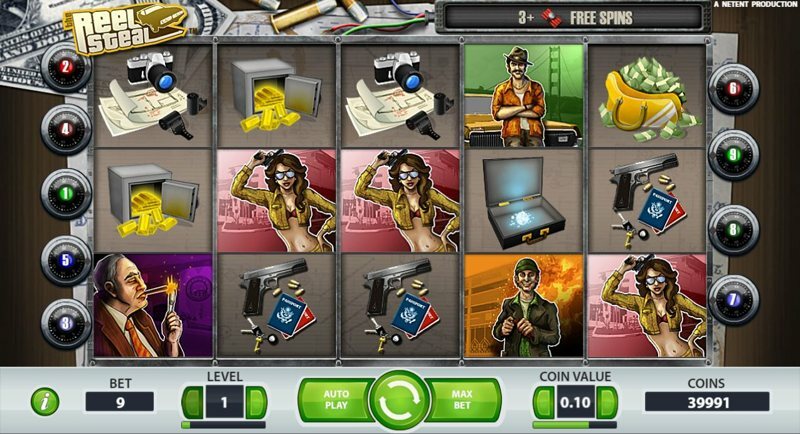 While there’s only 9 reels, the game uses 3 rows and 5 pay lines, and during your playing experience, you’ll be following in the footsteps of ambitious crooks, as they attempt to steal reels of gold from right under the Cops’ nose. A big bonus, is that you won’t find any of the lower-paying playing card symbols, including 10, Jack, Queen, King, and Ace. Instead, all the symbols are game-specific, and this includes a Pistol, a Camera, a set of Blueprints, a Diamond, hidden in a Suitcase, Bags of Banknotes, as well as a Safe filled with Gold Bars. There’s also the high-paying symbols, which include five mafia-looking fellas – not the guys you want to get on the wrong side of. There’s also a wild symbol – which you’ll want to pay a very close eye on later in the game – and this wild is simply a Yellow New York taxi. Typically higher-variance games (like Reel Steal), offer great chances to win big, both in, and out of the base-game, and Reel Steal is no exception. 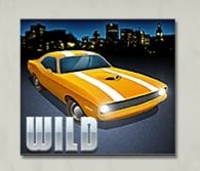 Featuring a very similar feel to Microgaming’s “Break da Bank”, and “Break da Bank Again”, if you manage to use one of the Taxi Wild Symbols as part of a winning pay line, that win will be subject to a 5X multiplier; not bad for the base-game, huh? Make a win using the Taxi Wild Symbol (you know, the one that pays 5X in the base game), and your win will be multiplied by a gigantic 25X. That would turn even a modest £10 win into £250 – and it’s pretty easy to see why Reel Steal is a game many players like to have a shot at every now and then. You can also earn more free-spins – no the conventional way – but instead, by landing just one scatter symbol in view. 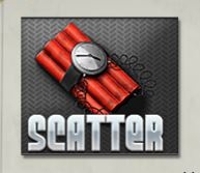 This will award one extra free-spins, with each scatter symbol you land awarding one more free-spins. While the game may be relatively high-variance, if you can hit the free-spins round hard, you’re looking well into the 250X + stake range… and there’s a ton of YouTube videos with players getting far more than that, with 3,000X + absolutely feasible.